Please join me Thursday, August 2nd, 6-9pm, for an Open Studio event at Bose Pacia. I will be sharing new work in progress, and my process and experience so far, in creating a humongous, mechanical, shadow puppet in the studio space! Thursday, 6 September: An exhibition of work in progress and panel discussion focused on interdisciplinary collaborations. All day, Friday-Sunday, 28-30 September, DUMBO Arts Festival: Events at the gallery will include live performance and the completed shadow puppet installation by Priyanka Dasgupta.Born in Kolkata, India in 1979, Priyanka Dasgupta has a MA in Studio Art from NYU/ICP (2003) and a BA in Literature from St. Stephen’s College, Delhi (2000). She has participated in the Aljira Emerge with Creative Capital (2007) and AIM Program (2005). 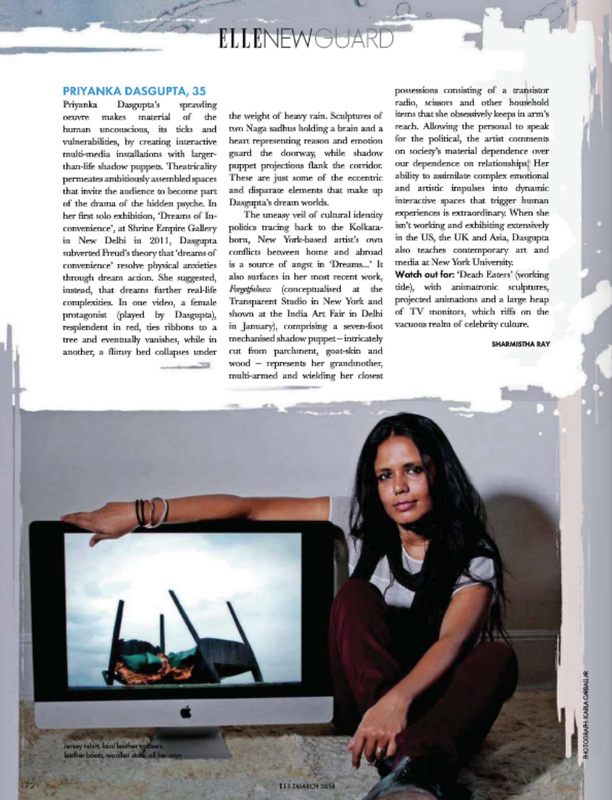 Dasgupta is a recipient of a National Endowment for the Arts award (2004). Her video installations have been exhibited extensively in the US, Europe and Asia including The International Center of Photography, Wagner Gallery, Galleria di Piazza San Marco, Shrine Empire, and Seoul Art Space . Dasgupta’s work belongs to several prominent collections. She lives and works in New York, NY.